With microbreweries attempting their own brewing processes and new unique flavours the UK drinks market is experiencing a big craft beer boom. The craft beer movements’ sales have shot up over the past couple of years, from tart ‘sours’ to ‘coffee porters’ and all the bits in between. The sales are in fact estimated to make up 6.5% of the total beer sales across the UK. There are over 2,000 microbreweries running in the UK and the craft beer scene doesn’t look like it’s going to slow down just yet. However, running a microbrewery can be quite intense and use a lot of energy in the process with it coming to quality over quantity. Entrepreneurs looking to start creating their own beer face many challenges, one of the main ones being which energy supply to use (especially if they’re off the mains gas grid), as well as keeping the costs down. Thankfully, the energy experts at Flogas have some words of wisdom for those looking to kick-start their own successful brewery. You could be the most passionate person in the world about brewing your own beer, however your dream could be over before you know it if you aren’t making a profit. To ensure this doesn’t happen to you it’s important you choose an energy strategy that reduces your usage as well as the costs. 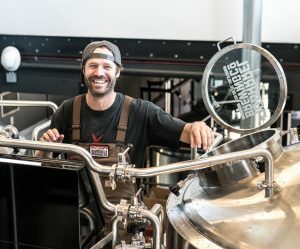 Microbreweries can be notoriously difficult to get off the ground financially, so by doing this, you can help boost your company’s profit margins. And this is just the mashing stage. Further to this, you’ll need a fermentation system (where yeast is added and sugar turns into alcohol), a cooling system (to prevent bacteria growth and where beer can be stored ready for sale), a filtering system (to get rid of sediment for a higher-quality product) and, of course, not forgetting the sterilisation equipment (to ensure that bacteria doesn’t spoil your next batch of beer). Barley – Barley plays a key role in the alcohol percentage of your beer and can dramatically affect the body, taste and aroma of your finished product. Water- It may sound obvious, but water makes up around 90 percent of any beer. The pH and mineral content of your chosen water, as well as if it’s hard or soft, can also affect the end result. Yeast– An invisible but key ingredient to any good beer – yeast has been used in beer brewing for centuries. Essentially a fungus, yeast eats the sugars created in the malting process. By allowing it to ferment and feed off the sugars, alcohol is created as a byproduct. Hops– Ever wondered where your favourite beer gets its distinctive flavour? Chances are it’s the hops. There are around 170 variations, meaning there’s plenty of choice when it comes to playing with flavour. Getting your own microbrewery up and running is no easy task. Alongside all the complications of the brewing process, the last thing you’ll want to worry about is high energy prices or even worse an unreliable supplier. If you’re operating at a rural location and looking for a reliable LPG supplier or you’re connected to the grid, the looking into a highly competitive commercial gas deal then you have to make sure you make the right choice. Considering LPG but currently using oil or solid fuels? It’s worth considering the fact that LPG is a cleaner, cheaper and a lot more efficient, which could be a key factor to making some big savings on your energy bills. LPG also has the lowest CO2 emissions out of all the fossil fuels, which means a lower carbon footprint for your new business.